We have been teased by the concept of flexible displays for a long time now, but finally the time has come for us to witness what was once a cool tech demo in an actual product. Greetings, LG G Flex. Featuring a 6.0″ 720p flexible OLED display, the G Flex pioneers LG’s lineup of curved smartphones. It’s an important product in a freshly introduced category of smartphones and the company hopes it lures adventurous customers with a plethora of cool features both on the hardware and software fronts. The LG G Flex is based on the LG G2 – it’s powered by a Qualcomm Snapdragon 800 SoC with 2.26GHz quad-core CPU. The rest of the specs are equally similar and include 2GB of RAM, 32GB of built-in memory and 13MP camera. The smartphone packs full connectivity suite, including compatibility with the speedy LTE-A networks in Korea. 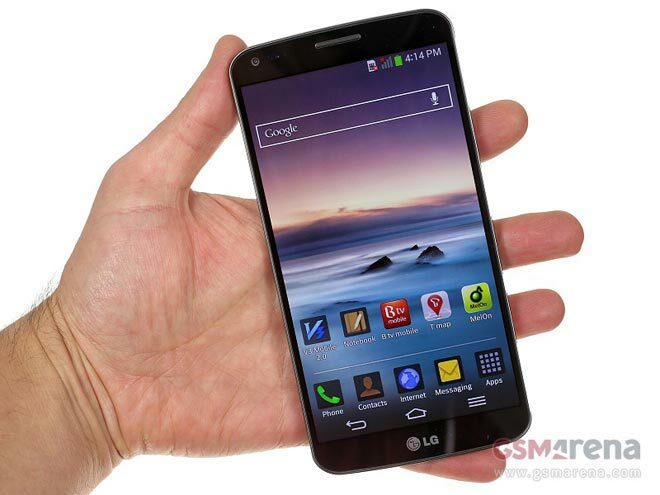 It will boot Android 4.2.2 Jelly Bean dressed in LG’s proprietary UI. On the outside, the G Flex is made of plastic. Interestingly, it’s capable of bending quite a lot when pressed in the middle, the phone straightens up without any damage. Even more impressively, LG has worked out a innovative coating that’s placed on the back of the G Flex, which self-heals from light to medium scratches. The measures of the LG G Flex are 160.5 x 81.6 x 7.9/8.7mm (the thickness of the phone depends on the point of its curve), while its weight tips the scale at 177 grams. The handset is powered by a 3,500mAh battery which is massive and we suspect it’s going to be a real trooper when the time for our battery tests comes. At the back, the button placement is virtually the same as the G2. There’s the power button tucked between the volume rocker buttons. The camera is on top of them all and has an LED flash sitting on its right, while an IR blaster sits on the left side. A particularly cool feature is that the power button glows and acts as a notification light. As we mentioned earlier, the most notable feature of the LG G Flex is its curved display. It’s a 6″ P-OLED display, which thanks to its curve offers improved legibility when strong light sources are present. Its colors are also very pleasant to look at. Where it disappoints though is the resolution – at 720p it offers a pixel density of 245ppi, which is okay, but not spectacular. Check out our hands-on video of the LG G Flex below and stay tuned for the full review.